Camping Bi-village is one of the absolute top campsites on the Istrian peninsula, the camp is situated just south of the tourist village Fažana, overlooking the Veli Brijuni Island, the main island in the Brijuni Island and the home of the National park Brijuni. The camp has app. 1100 pitches, all equiped with electricity and water. The sanitary facilities of the camp are according to European standards, in total there is 5 sanitary buildings. For an extra fee guest can book a private / family bathrooms in any of the 5 sanitary building. Sanitary facilities for disabled person as well as an area for changing of babies are also available. The camp is divided in to a non reservation area, where guest can freely choose their pitch, and 3 zones where reservation is required, each of the 3 reservation zones has different shift days (Tuesday, Friday, Saturday). 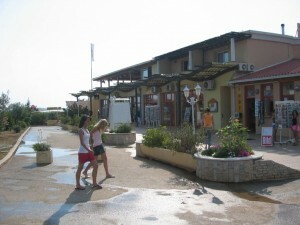 The camp offers Villas, Apartments, Luxury rooms as well as mobile homes for rent. 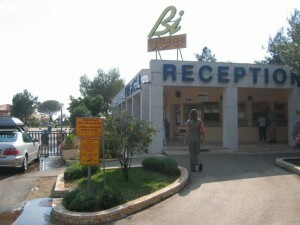 In terms of facilities, Bi-village has more or less everything, basic facilities like laundrette and internet cafe are complemented by, a Call shop, a gift shop, a supermarket and several other shops. Large parts of the pitch area have Wi-Fi access, so you sit in your tent and check the news from home. The sport facilities at the at Bi-village, includes a pitch for Beach volley, handball / football and Basketball, water sports like windsurfing, diving tours with a banana boat is also part of the camps program. For seniors the camp offer specialized fitness program. The Camp Bi-village has around 1100 lost, situated in shady Mediterranean vegetation, the lot sizes vary from 60 to a 120 m2, ALL with electricity and water.